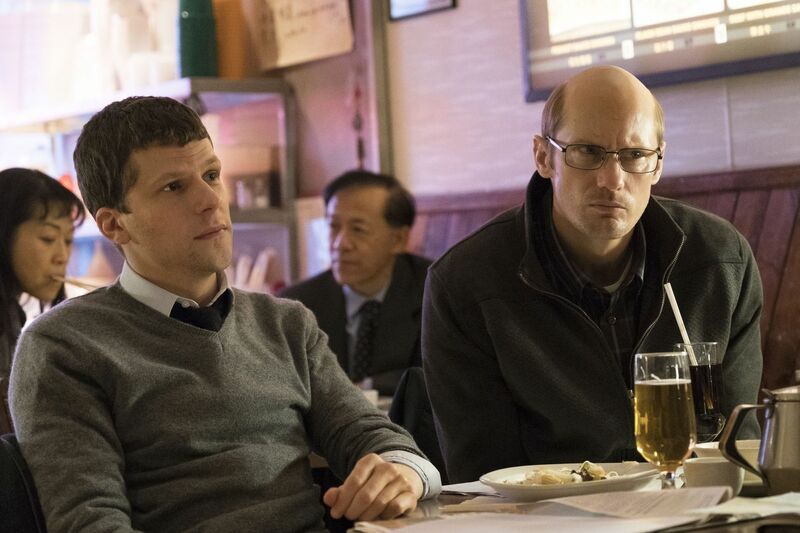 "The Hummingbird Project" - L to R - Jesse Eisenberg and Alexander Skarsgard. In the time it takes a hummingbird to flap its wings, a Wall Street guy with an algorithm and a good data connection can make a fortune — and also say “Screw you” to a competitor whose set-up is a millisecond slower. This is my way of explaining the context of The Hummingbird Project, loosely based on the frenzied competition that peaked about five years ago to bring the fastest trading speeds to big-time traders. Fiber-optic cable made financial transactions much faster, and some firms discovered that a millisecond advantage would allow them to trade enormous blocks of stock (or commodities) at lightning speed, so that even tiny profits — multiplied exponentially by computer trades — could yield handsome (and maybe unethical) profit. Jesse Eisenberg stars as Vincent, a fast-talking trading firm hotshot who recruits his coworker and software genius cousin Anton (Alexander Skarsgård, made up to be bald and frumpy) to join his endeavor to run a high-speed fiber optic system from the Midwest data center to Manhattan. Vincent handles the hardware (using the kind of horizontal drilling rigs used for fracking), and Anton is working on the software, hoping to shave off those tiny increments of time. Hummingbird allows the frenetic Eisenberg and reserved Skarsgård to play to their strengths, although one of Skarsgård’s strengths is being handsome, and if you want to see him in that mode, you’ll have to wait until next week, when you can see him stare with smoldering eyes at Keira Knightley in The Aftermath. Salma Hayek has fun here as their hard-driving ex-boss, a woman who also wants to win the high-frequency trading war. She regards the abrupt Vincent/Anton exit as a betrayal, and sees the competition not only as a means to profit, but as a satisfying route to personal revenge. Though mired in arcane subject matter, the movie is always lucid and reasonably engaging — maybe unintentionally so for Pennsylvanians, who can have fun trying to guess the locations Hummingbird used as stand-ins for rural parts of the state. Those mountains are beautiful, but they are not the Appalachians. Writer-director Kim Nguyen gives the story an admirably ambitious framework. He looks at not just the obvious ethical implications of firms using speed to gain an advantage unavailable (at the time) to average-joe investors, but larger questions about the moral virtue (to borrow a phrase from Adam Smith) of such activity. The computers don’t know, or care, about what they are trading. There is no consideration of the worth of the underlying investment, certainly no consideration that a stock or commodity is an expression of important human endeavor. In the end, Hummingbird wonders if the expensive and ultimately Pyrrhic high-frequency trading wars — bringing speed to trades that were already fast, liquidity to markets already liquid — served anyone. The Hummingbird Project. Directed by Kim Nguyen. With Jesse Eisenberg, Alexander Skarsgård, Salma Hayek, Michael Mando, and Sarah Goldberg. Distributed by The Orchard.